Jim DeMint, the Tea Party leader who got booted last month as head of the Heritage Foundation, will now dedicate himself to the drastic option of calling a Convention of States to amend the Constitution. His move to join the "Convention of States" project as a senior advisor — first reported by USA Today — will raise the movement's profile. Why this matters: A large and growing number of conservatives — the Convention of States project boasts more than 2.2 million supporters throughout the country — are concluding that the election of Donald Trump will do little to change the permanent bureaucracy in Washington. If Trump — who promised radical disruption of D.C. on the campaign trail — fails to get big things done in his first term, movement leaders believe that will give them a stronger case to amend the Constitution. What is the Article V movement? A group that believes the only way to fix Washington is to invoke Article Five of the Constitution, which gives states the power to call a convention to propose amendments to the Constitution. Conservative talkshow host and author Mark Levin is an intellectual leader of this movement, and the grassroots leader is Mark Meckler, who runs the group DeMint is joining. "I've finally realized the most important truth of our time: Washington, D.C. will never fix itself. 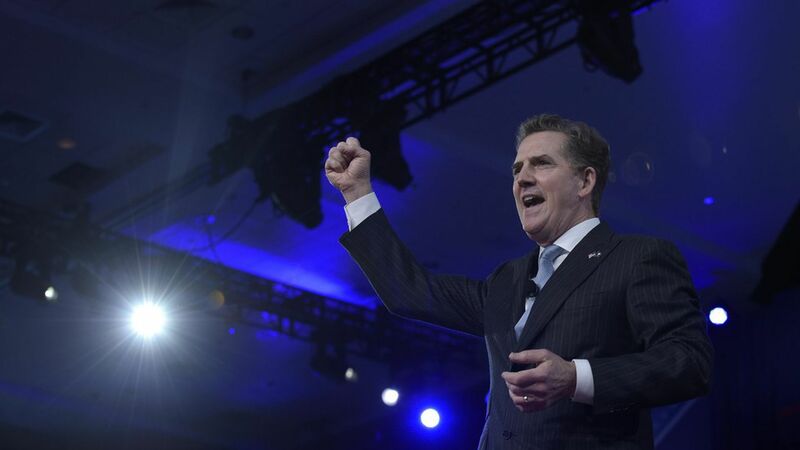 Convention of States is the only solution," DeMint said Monday in a statement explaining his move. The changes they want: "Twelve states have passed the Convention of States resolution calling for fiscal restraint, limiting the size, scope and jurisdiction of the federal government, and term limits on federal officials, such as judges," the group says.